Luxury pocket square in white jacquard satin to complement your look. Luxury pocket square in white jacquard satin to complement your look. 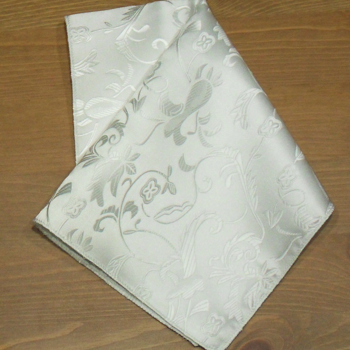 Fashionable handkerchief in smooth satin with jacquard weave to complete a suit pocket or present as a little gift. We can add personalisation to this pocket square with embroidered initials, a numerical date OR a single name towards one bottom corner of the kerchief.